At our upcoming 2014 Spring Tour of Orange County Artists Guild you will have an opportunity to meet and greet many of our artists, some new and some seasoned participants in the tour. For one weekend you can motor around to 19 select spots to view and purchase their work. The dates and hours are Saturday, April 12, 10 a.m. to 5 p.m. and Sunday, April 13, noon to 5 p.m. The 2014 spring tour flyer and map PDF is now available; you can print this off. You can also view the locations right on google maps, which you can reference on your smart phones or digital readers while you are on the tour. A group show will be held at the Chapel Hill Art Gallery, 1215 E. Franklin Street, Chapel Hill, NC 27514. The show runs from Apr 10 to Apr 28. 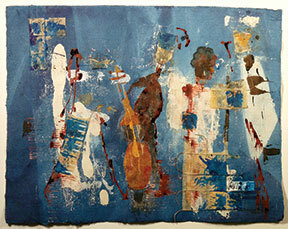 The reception is Friday Apr 11 from 6 p.m. to 9 p.m. If you are not already acquainted with participating individual’s works, here is a brief overview of each artist’s perspective on his or her particular type of craft or art. 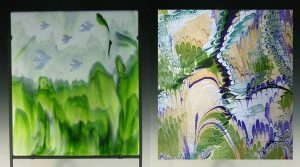 Trudy Thomson notes that her work, in fiber or fused glass, reflects a flow and flutter of shapes and “scapes”. Organic designs in glass appear hard and edged, or in fabric soft and diffused. Each glass-faceted piece has layers that reflect and transmit the light. Each wall-displayed piece of marbled silk or marbled scarf has layers produced from a hydro-print after manipulating paint on a viscous bath. As a result, each piece is unique and reveals cross currents of pattern and form. You can see more of Trudy’s work at her website. Eduardo Lapentina’s ambition is to use symbolic shapes and colors to express his deepest emotions and passion for life. This leads him to apply paint to the canvas in unusual ways by pouring, splashing, dripping, and scratching. 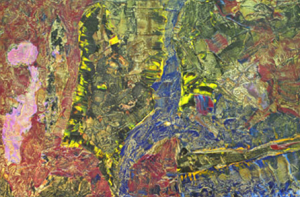 His sensuous and turbulent surface texture is as vital and as complicated as life itself, and the steps leading to his abstract paintings are the art of “hiding and disclosing”. The discovery of mysteries of the subconscious mind are part of his own personal legend. You can see more of Eduardo’s work at his website. This piece of wearable art created by Jane Levy invokes the mystery and drama of the shaman-like power the artist wields from her resources. Many of the motifs she uses symbolize change and transformation, which may include such things as a dragonfly or a gingko leaf. She also employs “Sashiko” (a style of stitching over to mend materials in Japanese culture). 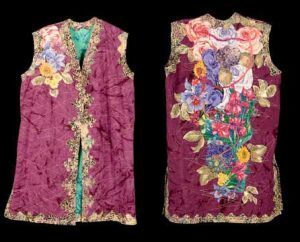 She learned a process taught to her by Roxanne Lessa: she draws and designs her own pattern from a photo, assembles it piece by piece with a fusible web, then quilts and paints it. With Carol Retsch Bogart, it’s all about “the blend”. As she works, various mediums come together including acrylic paints, encaustic wax, paper, pencil, and oil pastel. In each collage, the textures, patterns, and colors play off each other. Spilled paint or torn paper add to the whimsy of a piece. But there is more than playfulness evident in Carol’s depth of expression. There is a link between her work as a psychotherapist and as an artist. She finds that people’s lives are textured by complicated nuances of emotions and experiences. So it is with art as with people: the surprises and sudden realizations become part of our integrated selves. Porcelain objects can be made thin and translucent as seen in the works of Deborah Harris which blend earth and sky for a quiet contemplation of nature as sunlight passes through the walls. Porcelain has a silky touch while being turned and can be finished to the softest, smoothest surface. Texture is then achieved with various ribs, carving tools, hand made stamps or found objects. 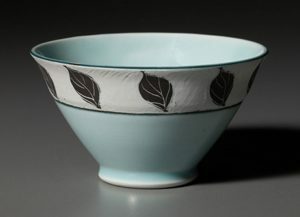 Covered with traditional Chinese celadon glaze, world cultures and human movement influence her work. See Deborah’s work at her website. 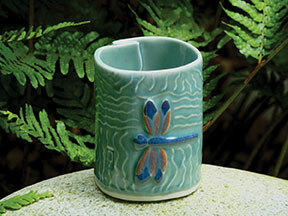 Gail Schaefer of Buckhorn Pottery designs and creates both functional and decorative earthenware pottery. 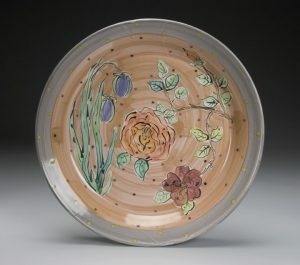 Her surface designs have been influenced by the majolica pottery traditions of the Italian Renaissance. 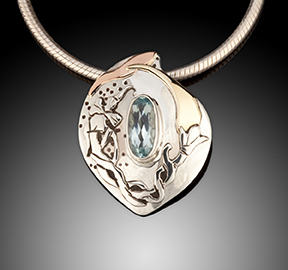 While striving to make unique eye-catching pieces, Gail has brought other aspects of her life into her work. These include her love of gardening, flowers, and birds. Since starting in clay in the mid 1970’s, her pieces have evolved as she feels she has, from stoneware to earthenware, and from a cobalt blue line to the palette of a rainbow. You can see Gail’s work at her website. 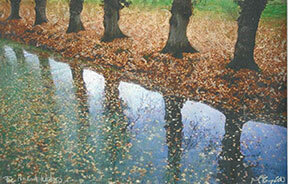 RuthAnanda paints trees, birds, and leaves in acrylics on large and small canvases. Her paintings are semi-abstract, influenced by yoga, meditation, and a love of nature. Last year she began a series of miniatures that may sit on a tabletop as well as hang on a wall. They look beautiful as singles or in groupings, and have been popular as gifts. Pictured is an 8″x4″ diptych. You can see more of Ruth’s work at her website. Ceramic artist, Heather Delisle, draws inspiration from nature as she replicates textures and patterns of the natural world in her handmade, decorative sculptures. Heather incorporates her interest in arranging modules to produce sculptures which reflect nature’s repeated patterns. Wall-hung and balanced, ceramic spheres are wheel-thrown and kiln-fired before receiving the final surface treatment. 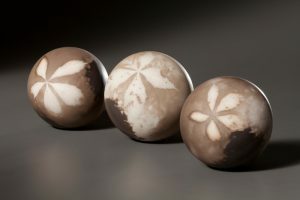 They are finished in a sawdust firing which gives each sphere a unique carbon imprint from the organic material burned on its surface. 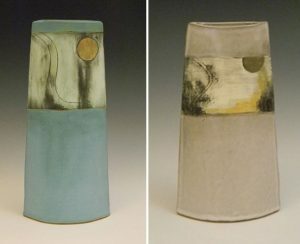 Emily Lees creates softly geometric, stoneware slab vessels that remain functional while transcending craft. Her flat vertical vessels, or “flounders”, create interplay between two and three dimensions. Seen from the front or rear, they appear to be rounded. It is only when seen from the side that the tension between interior and exterior space becomes apparent. Her forms and glazes reflect the influence of the quietness and asymmetry of traditional Japanese art. On contrasting panels, she creates abstract urban landscapes and meandering rivers. Images are merely suggested, however, leaving the viewer free to interpret mood and meaning. Hollie Taylor paints landscapes that convey the deeply felt spirit and energy of natural forms. Hollie finds that the mixture of different media make surprising surface juxtapositions. 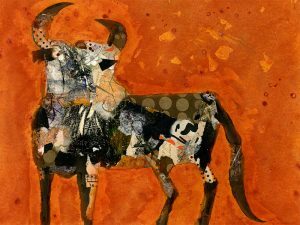 In the past decade, she has produced clay wall works and sculptures which explore clay based mixed media. After a workshop she took in Oaxaca, Mexico, Hollie began creating a series of ceramic post cards named Postcards from Oaxaca. 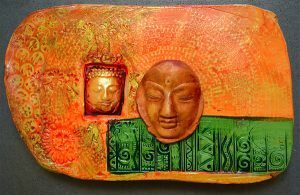 Stamped, textured, and cold finished with acrylics, this dimensional work includes a clay relief image of Buddha. See more of Hollie’s work on her website. Nadine Zenobi notes that this “long and cold winter has set a tone for inward creativity”. She feels lucky to work in a studio filled with windows and light, so that she may draw upon the exquisite cycles of the natural world. Even though it is still and quiet outside, her studio is filled with movement. Working with stones from all over the world is the greatest inspiration to her work as all pieces are created around them. Using these bright and beautifully colored gems gives Nadine the inspiration to bring uniquely fabricated designs into the metal. Nadine looks forward to sharing her new creations which have emerged through winter’s folding in. See more of Nadine’s work at her website. David Terry’s drawings and paintings are featured regularly in national publications such as The Oxford American and The Washington Post Book Review, in addition to numerous commercial gallery exhibitions since 1990. His work includes meticulously drawn, multi-image, pen & ink montages, Southern & French landscapes, and portraiture (primarily of dogs and people). His work has been critically praised, primarily for its recasting of Southern iconography and literary portraiture. David’s work can be viewed at his website. Bernice Koff uses her heightened sense of color to begin her abstract paintings. She pours acrylic inks and paint directly onto varied surfaces, such as handmade papers, canvases, digital photos, and sheer rice paper. As images emerge, she refers to her vast file of photos taken during travels abroad. Her collection of collage papers both purchased and painted by hand often create ideas spinning around inside her art-infused head. Here is where the interplay of collage and paint begins. Trying to preserve the beauty of the original paper causes works such as All That Jazz to be spare and carefully crafted. 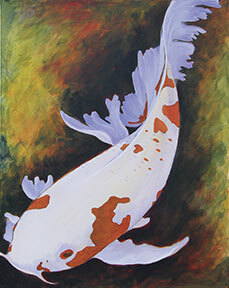 See the variety of Bernice’s work on her website. Carolyn Doyle is a founding member of the Red Clay Co-op and has a studio at the Clay Centre in Carrboro, where she also teaches classes on the pottery wheel. Her ceramic art is made in stoneware and decorated with leaves that have been collected locally. She is particularly interested in colorful glaze palettes that mimic “reduction firing” and reflect colors seen in natural settings. When not working at the Clay Centre, Carolyn crafts quilts and scarves, again borrowing images, colors, and textures from the local landscape. Her work can be seen at Womancraft in Chapel Hill. She comments, “My goal is to create beautiful items that people want to touch and use everyday”. Barbara’s Higgins built the Clay Centre in 2002 and has provided a venue for teaching there for 11 years. 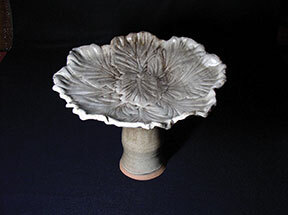 Her porcelain work is wheel-thrown and hand-built, and includes many carved textures and handmade clay stamps. Many stamps have images of leaves or ancient symbols, and come from Barbara’s interest in petroglyphs and Asian prehistory. Barbara has traveled extensively to aboriginal sites in the Southwest and more recently to temples in Asia, and was struck by the quiet, mystical nature of these sites which were important to early peoples. Barbara is fascinated by earlier cultures’ use of clay pieces for functional and ritual purposes, such as the tea ceremony, and Barbara enjoys creating functional pieces for modern use. Jeannette Johnson, who works primarily in acrylics and watercolor, experiences the world in ways that are unique to her. She considers art a language and each of her works a dialogue between subject and observer, artist and medium, or artifact and viewer. The decisions she makes during the course of her painting are based on the continual development of this dialogue. She begins with her initial response to the subject matter. As the work progresses, her choices are based on the materials that she is using and the image that is developing. She says, “In my current work, I have decided to work with a limited palette and to select colors in response to the overall composition. This frees me to concentrate on the dynamics of a particular gesture or to emphasize the unique qualities of shapes and contours.” You can see more of Jeannette’s work at her website. Natalie Boorman’s hand-built, clay vessels are symbolic forms that she uses to hold her internal experiences. She begins with a sphere of clay. “I pinch an opening, elongate the form by using my arm, then place it on a sling or “nest” where I allow it to rest. As it rests there, I continue pinching the pot into a large circular form. I make the walls as thin as possible, and sometimes holes form which I patch as I go. There is a very similar opening in all of the pots, which occurs spontaneously as I create the shapes with my fingers and hands.” Natalie experiences a kind of intimate oneness with the clay as she works, and her pots have a fullness inside bound by the exterior of the clay. After years of fascination with clay and hand thrown pottery, Vera Shanley decided to pursue her own future in clay as a creative outlet. From 2001-2005, Vera traveled throughout the world as a volunteer physician in developing countries such as Burma, Vietnam, Peru, Bolivia, Brazil, Nepal, and Tibet. 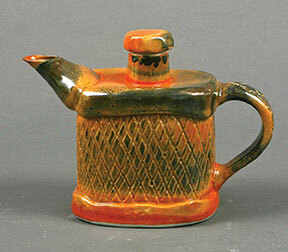 Unusual forms, uses, and shapes, different habits, and customs from other cultures all enabled her to bring home new ideas to influence her pottery. 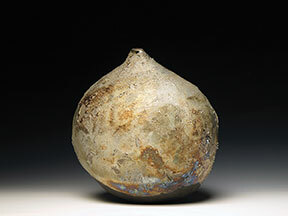 While she is curious about varying shapes, forms, and textures, her pottery has a common characteristic: that of fulfilling a purpose both functionally and spiritually. 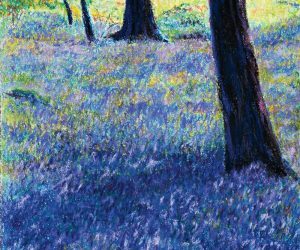 David Taylor comments on his paintings: “Walking down the path in an unfamiliar wood, you suddenly come upon a glade bursting with color. These must be wild hyacinths! Do you call your friends to come share your wonder, or do you keep it your secret, marking your calendar to revisit each spring in early April?” David works in the outdoors as well as in his studio with oil, acrylic, and pastels, portraying the life and beauty around us. He strives to capture a moment before it is lost, working quickly with color, detail, and many bold strokes. He wishes to allow the eye of the beholder to complete the painting. See more of David’s work at his website.